Pasteur convinced himself that this property of molecular chirality was a barrier separating the living from the inanimate worlds – almost an echo of the vitalistic belief in the specialness of organic nature that Pasteur’s work on microbes and ‘spontaneous generation’ helped to dispel. He set out to find the origin of this handedness of life’s molecules. There’s always a little madness involved in pondering life’s handedness. Why does DNA have its right-handed double helix, and why are chiral amino acids in proteins only of the left-handed variety? Was this pure chance or determinism? Some have sought an answer in the tiny degree of left–right symmetry breaking evident in the weak force, although it would demand some extraordinarily powerful magnifier (perhaps an autocatalytic feedback in prebiotic amino-acid synthesis?) to make the resulting difference in stability manifest in chemistry. This isn’t so mysterious. After all, the energy of turbulent flows is transferred to ever smaller spatial scales before finally being dissipated in friction at the molecular level. I shouldn’t be surprised, though, if hypotheses emerge about the first living entities having opposite chirality in the northern and southern hemispheres of our planet – agitated by the Coriolis force that gives cyclones opposite senses of rotation either side of the equator – before doing Darwinian battle. Do the maths and you’ll find that such influences would be utterly negligible even at the level of organisms, let alone molecules. 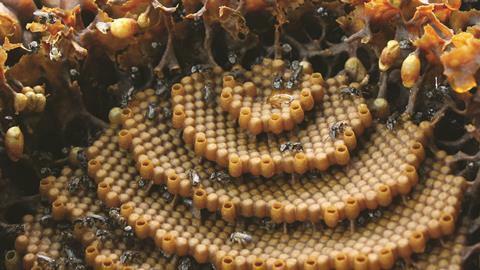 But that didn’t stop an extraordinary number of people insisting (wrongly), when I wrote recently about the amazing spiral nests of Australian stingless bees Tetragonula carbonaria,3 that they would surely rotate the other way in the north. If you take a pyramidal ‘symmetric top’ molecule like ammonia or phosphine (PH3) and rotate it, you produce chiral motion: clockwise rotation isn’t superimposable on its mirror image. But that kind of symmetry breaking doesn’t make the molecule itself chiral, much as chiral arrangement of SiO4 tetrahedra in optically active quartz doesn’t give these units a handedness. The researchers say, however, that PH3 can be given a chiral structure if it is highly rotationally excited, because in that case the motion actually distorts the molecular structure, due to a Coriolis force acting on the spinning molecules. This force makes one P–H bond shorter than the others, removing the equivalence of the hydrogens. That breakdown of permutation symmetry, coupled with the unidirectional rotation, creates two enantiomers. Then by using a strong static electric field to align the axis of rotation (along one P–H bond), either enantiomer can be generated selectively. Such rotationally induced chirality has been mooted before, but not much explored because of the difficulty of producing highly excited rotational states (rotational quantum number J of 40 or so) with a rather narrow and well defined distribution of states. It’s now made possible in principle, though, by the advent of intense, ultrashort laser pulses with the kinds of tailored polarisation needed to excite extreme rotation. Such a pulse, called an ‘optical centrifuge’, should have linear polarisation that not only rotates helically around the direction of polarisation but does so at an accelerating rate, so that the ‘thread’ of the corkscrew rotation gets ever tighter. The researchers’ quantum-mechanical calculations indicate that for J=42, rotationally induced chirality should be achievable and observable with realistic experimental parameters. And that’s their goal now.